22nd January 2018 17th January 2018 Editor. 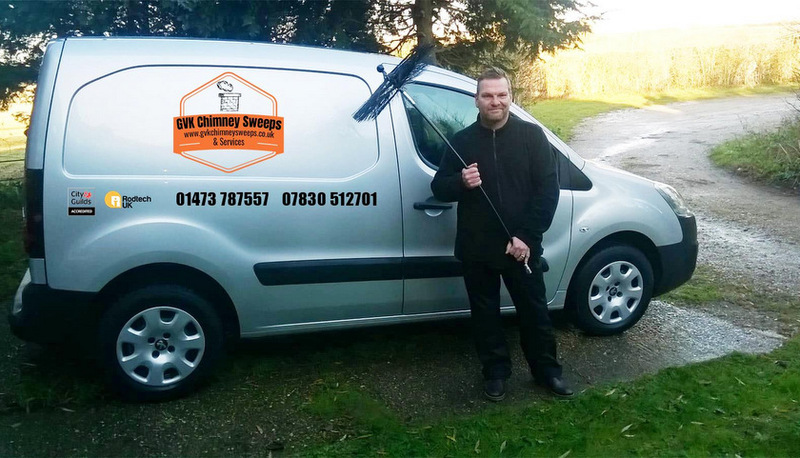 GVK Chimney Sweeps and Services is a small family-run business based on the Shotley peninsular. Owner Gordon Pooley takes great pride in providing a reliable, friendly, clean and tidy service to all customers with the introduction of power sweeping technology. The company offers a CCTV inspection service if required at the time of sweeping or upon request, and a smoke evacuation test is carried out after every single sweep. Although based in Ipswich, GVK covers Essex and Norfolk. Gordon has completed the City & Guilds Accredited Programme of Competence in Chimney Sweeping and Advanced Fault Finding. If it’s time to schedule a chimney clean or if you simply want a quote or advice, give Gordon a call on 01473 787 557 // 07830 512 701.